This is my stock version of the North American XB-70 Valkyrie. This unusual-looking plane was developed in the 1950s and 1960s as a Supersonic nuclear-capable bomber. It was designed to cruise and drop bombs at Mach 3. While cruising, the ends of its huge delta wings folded down. 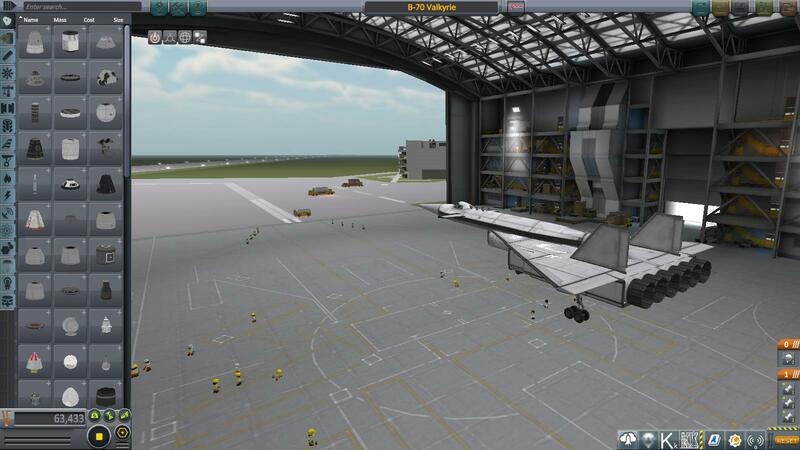 Sadly, no stock part in KSP can make the wings do that. I have provided a bomb bay and a bomb (fuel tank) to drop. The plane has been tested and will work. Only 2 Valkyries were made. 1 was lost in 1966 when an F-104 Starfighter collided with the bottom of the right wing. The plane had been flying in a pyramid formation with a T-38 Talon, F-4 Phantom II, F-104 Starfighter and F-5 Tiger, with the XB-70 in the middle. For an unknown reason, the F-104 tucked itself close under the right wing, then pitched up, and straked across the XB-70’s wings, knocking off the tailfins. The F-104’s remains, now behind the formation, burst into flames. For the next few seconds, the Valkyrie continued to fly normal and stable, but then rolled and spiraled down to the ground. Pilot Al White ejected safely. Copilot Carl Cross had an ejection seat, but it didn’t eject for some reason. He perished along with the aircraft. The entire incident was filmed by a chase plane. A mod aircraft called B-70 Valkyrie. Built with 95 of the finest parts, its root part is mk2Cockpit.Inline.